:St. Louis emcee Flame returns with this third album release, the first in a two-part series. 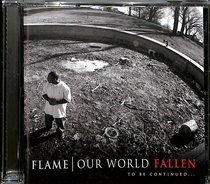 Our World: Fallen uses heavy imagery and thought provoking rhymes to detail the tragic downfall of a world without Christ. Features guest appearances from Diamone and Tedashii. More than anything, Flame wants listeners to know that Jesus is the Way, the Truth and the Life. "I always grew up influenced by Christianity. I liked the idea of going to heaven, and not to hell, and being on Jesus's good side, but I didn't want to take the steps to make that happen," Flame says. "I was caught up in the hip-hop culture of gangs and drugs myself and headed in the wrong direction." But a series of tragic events eventually got his attention. "After getting hit three times by an 18-wheeler, my grandmother told me I needed to repent and turn from my sin," Flame remembers. "Not long after she passed away from a heart attack, I went to church. There, I heard the Gospel, wept like a baby and was drawn to Him when I was 16. That's when I became a Christian. Shortly afterwards, I started writing music as little devotionals to God." Eventually, converting those ruminations to song, Flame hasn't stopped writing since and loves using the medium of hip-hop to not only minister to the hurting and build up the body of Christ, but to tell the story of His Savior to a world that desperately needs to hear it.